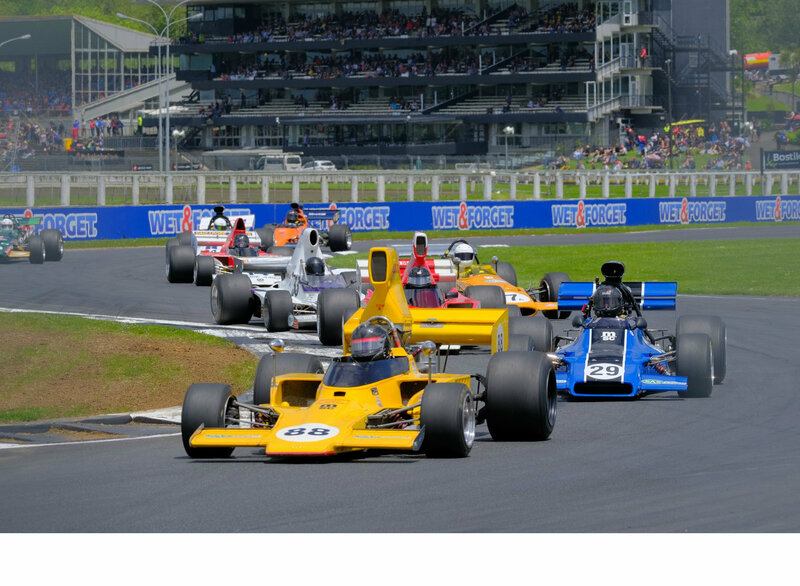 Taking up where he left off on the first day of racing on Saturday, Kiwi super-veteran Ken Smith (Lola T332) made it three wins from three starts in the third and final SAS Autoparts MSC NZ F5000 Tasman Cup Revival Series race at the annual ITM SuperSprint Supercars meeting at Pukekoke Park Raceway today. As he did in the second SAS MSC series 12-lap race on Saturday afternoon, the 77-year-old grabbed an early lead from pole position in today’s six-lap sprint and was never headed, crossing the finish line just over a second-and-a-half in front of series young gun Michael Collins (Leda LT24) with former series champ Brett Willis (Lola T330) third and series newcomer LeRoy Stevenson (McRae GM1) fourth. Because the race was shortened from the planned 14 laps to just six because of time lost repairing a safety fence after an accident in the Porsche series race immediately before, it was doubly important for Smith to get a good start and put a gap on Michael Collins. Which is exactly what he did, claiming his second fastest race lap of the weekend with a time around the notoriously bumpy 2.91km circuit of 1.01.4590. 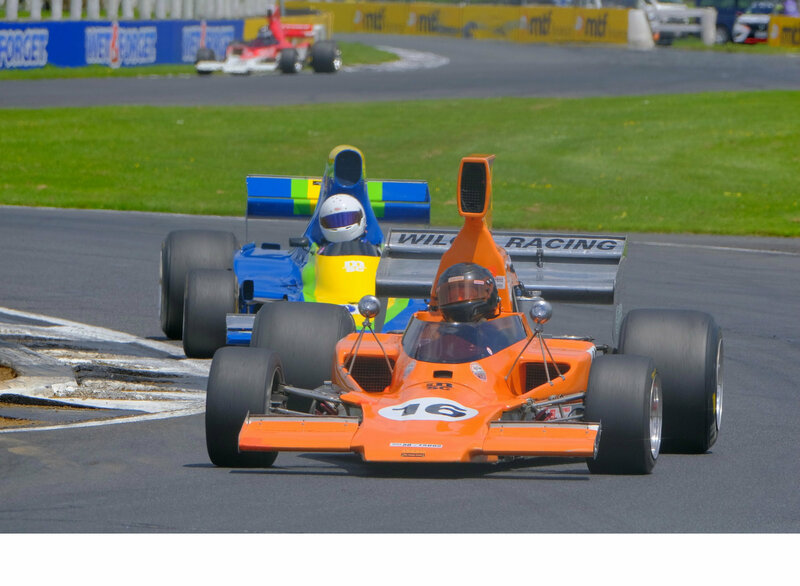 Second – for the second time in two races – was former South Island Formula Ford champion Michael Collins, enjoying another quick, clean race and the only other driver in the race to record a sub 1:02.000 second lap (stopping the clocks with a 1:01.7300). Collins had his first race in the SAS MSC series at the ITM SuperSprint meeting a year ago so knew the track. But the 22-year-old admitted that he still found the lack of run-off and proximity of concrete walls at the track’s fastest sections a little disconcerting, particularly this weekend as he was behind the wheel of car owner Alistair Hey’s freshly rebuilt ex Graham McRae Tasman Series-winning Leda LT27. Third after an entertaining race long battle for the final podium spot was former SAS MSC series champion Brett Willis (Lola T330), with series newcomer LeRoy Stevenson a hard-won fourth in Alistair Hey’s other car, the McRae GM1 Michael Collins raced last season. Stevenson had to start today’s race from the back row of the grid because he was the last recorded finisher (after pitting to check for damage after running through a gravel trap) in the second race on Saturday. He set the third quickest time in today’s race, however, (a 1:03.0860) as he worked his way forward. Where he would have got to had the race run its full 14 lap length is anyone’s guess though the man himself was just happy having been entrusted with Hey’s car for the round. 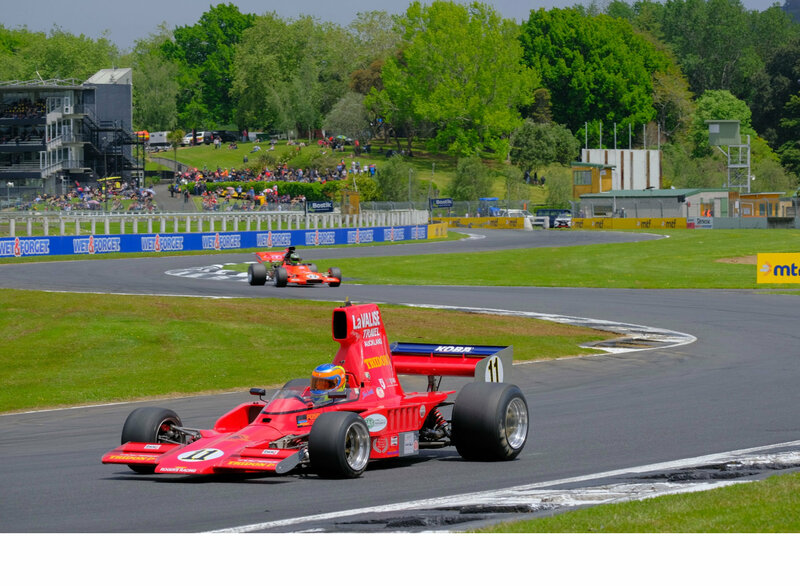 Also happy with the way his weekend panned out was series regular Glenn Richards (Lola T400) who finished fifth. After the disappointment of blowing an engine at the recent F5000 50th anniversary meeting at Laguna Seca in the United States, Richards was full of praise for specialist engine builder Craig Hyland who managed to rebuild the engine in time to get the car ready for this weekend’s opening SAS MSC series round at Pukekohe. As Willis and Richards diced for position early on a battle pack consisting of Tony Galbraith (Lola T332), Aaron Burson (McRae GM1) and Kevin Ingram (Lola T332) eased closer, with Galbraith just over two second behind Richards when the chequered flag came out, and Burson just over a second behind Galbraith in seventh, with Kevin Ingram, Shayne Winterburn making up the first nine cars home. Missing from the group, unfortunately, was David Banks, whose Lola T332 had a sticking throttle which could not be repaired in time. 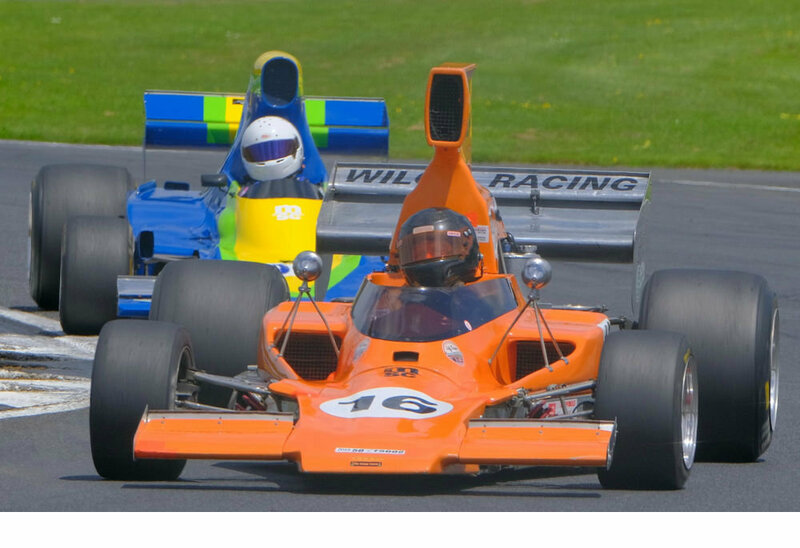 That left Tony Roberts in his newly acquired ex David Mitchell McLaren M10B tenth with Russell Greer (Lola T332) and Peter Burson (McRae GM1) completing the finishing order 11th and 12th respectively and Frank Karl the only non-finisher in his McLaren M10B. On Friday Ken Smith set a pole time – 1:00.6140 – just over 1.5 seconds quicker than category young gun Michael Collins in warm, dry track and weather conditions, then won the first race of the 2018/19 SAS Autoparts MSC season on Saturday morning in conditions which couldn’t have been more different – grey overcast skies, cool temperatures and a treacherous part damp, part dry track. The wily veteran, now embarking on his 61st consecutive season of top-level motor racing in New Zealand, didn’t quite have it all his own way in the first race – LeRoy Stevenson catching, passing him and holding the lead until the last lap. However as he and Smith closed on Russell Greer to put him a lap down Smith spotted a gap and eased down on a still patchy track on the inside. Spits of rain also fell as the 14-strong field lined up on the dummy grid for the second SAS Autoparts MSC 12-lap race of the weekend on Saturday afternoon, however the race was run on a dry track albeit still under a grey, overcast sky. Ken Smith'z T332 leads the final SAS Autoparts MSC NZ F000 Tasman Cup Revival Series race at the opening round of the 2018/19 series. Tony Galbraith (T332) heads the mid-field battle pack in today’s race. Former series champion Brett Willis (T330) leads Glenn Richards (T400).